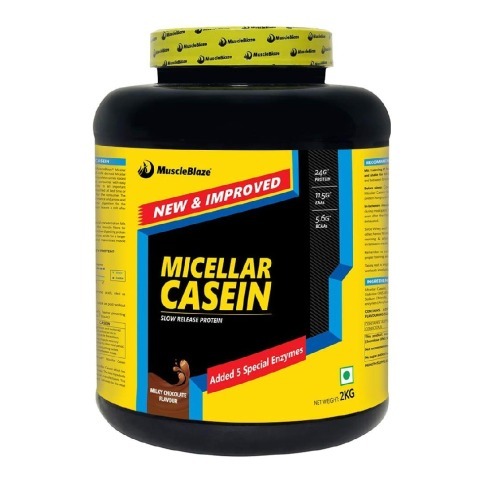 Micellar casein 4.4 lb milky chocolate provides 24g of sustained protein release along. 5.6g of BCAAs and 11.5g of EAAs. Casein releases essential amino acids for up to 7 hours even during inactive periods. nfused with 5 special enzymes that support easier digestion and absorption of Casein. Delectable milky chocolate flavour with 5 special added enzymes to help with protein digestion. Carbohydrates are a good source of energy. A good reason to consume carbohydrates post-workout is to replenish the muscle glycogen that we burned during our workout. Our main fuel source is muscle glycogen. Glycogen is the storage form of glucose. So, a higher amount of carbohydrate is useful in gaining body weight. To Recieve updates and possible rewards for MuscleBlaze Micellar Casein please sign in. To Recieve updates and possible rewards for Diet Supplement please sign in.